At Thanksgiving we conducted an experiment. 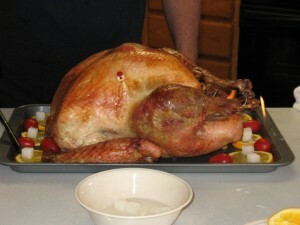 Apparently Great Grandma B used to present the turkey on a platter with flaming sugar cubes. She’d put cubes on slices of orange, then soak the cubes with lemon extract and light it On Fire! J, who is a 6-year-old Martha Stewart, envisioned a turkey surrounded by vegetables. She’d specifically mentioned tomatoes, so Grandma provided them. I don’t think that it quite lived up to J’s vision, but in 18 or 20 years, she can start hosting Thanksgiving herself, right? M, meanwhile, was hiding away in a desperate attempt to a) find serenity time from her cousins who would like her to entertain them constantly and b) avoid the open flame: I tell you Fire Safety Month every year has deeply affected her. The flames weren’t huge (you can see a bit on the right, above). Apparently almond extract doesn’t work quite so well? In any case, apparently in Days of Yore people would eat the melty sugar-cubed orange slices, but everyone was too distracted by the stuffing to remember to try it tonight. Happy Thanksgiving, everyone! We have so many reasons to be grateful. And I’m thankful to you for visiting the blog. Just spent the last 15 minutes catching up on everybody through your wonderful blogs. I am definitely going to try that sugar cube thing at my next family get together.